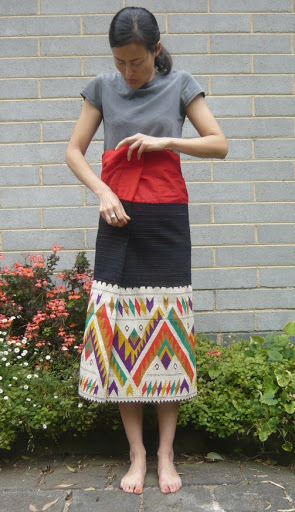 Refashioning ethnic dress is not a sinh! Remember I told you about my trip to the Talat Sao in Vientiane? Well, this was one of the things I purchased there. 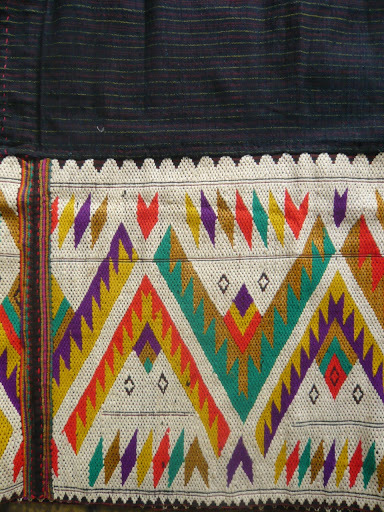 It’s a vintage sinh*, apparently from the Houa Phan region, where I have never been but am definitely keeping in mind as a shopping educational travel destination if there are more textiles like this to be found there. Despite all the delicate silk designs to be found in Laos, it’s the big, bold, graphic ones like this that are not so often seen that I tend to go for. I wonder if there is any meaning to this one or whether whoever made it just liked this kind of pattern? It kind of looks South American rather than south-east Asian, don’t you think? Anyway, the patterned part is actually just a width of woven material that has been stitched to two other lengths of material, one red, one navy with stripes, to form a sinh, the wearing of which I will now attempt to show you even though I have never worn one. 1. Step into the sinh, which is basically a tube, and pull the material all to one side. 2. Wrap the material from the back very firmly around to the front. 3. Fold the waist part over a few times to secure the fold. 6. 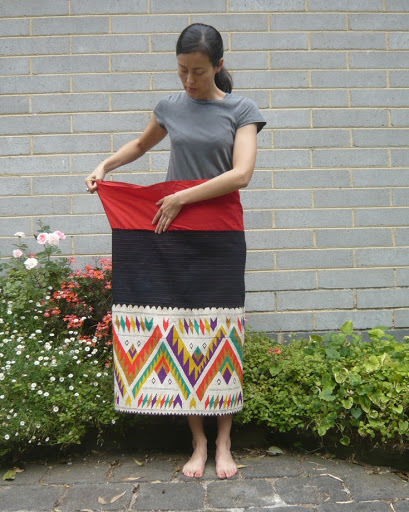 Give up on years of Lao tradition and make the sinh into a mini-skirt with a zip in the back and tucks in the waistband instead. Step 6 is fairly easily achieved with an unpicker and a sewing machine. All I did was remove the patterned part of the sinh from the navy section above it and put a zip in the centre back seam. Then I just put it on and stood in front of the mirror, pinning small sections first on the left and then on the right of my waist, front and back, until the skirt fitted snugly. I stitched these tucks down and that was it! 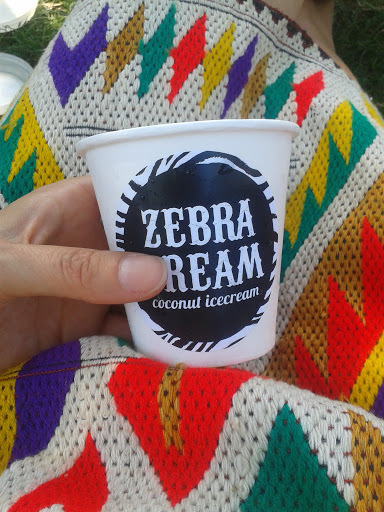 I was ready to hang out by the Yarra and enjoy some ice-cream at Melbourne’s Sustainable Living Festival. It was ridiculously hot and my photographer was as impatient as I was to get to the ice-cream, so we didn’t get many shots, but I think you get the idea anyway. 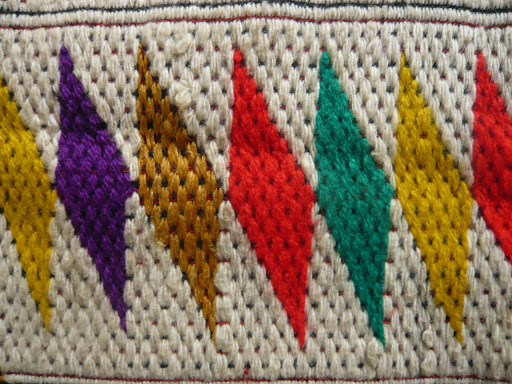 If you have a length of beautiful ethnic material that’s just sitting around, why not give this a go? 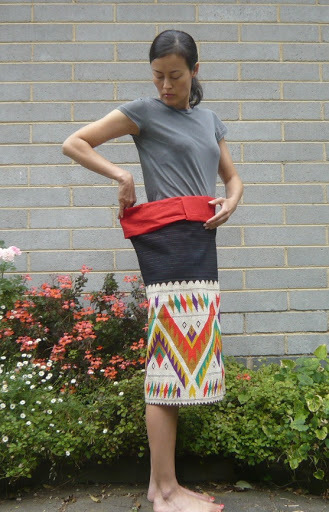 If it’s not wide enough to make a skirt of a length that you feel happy wearing, you can always stitch another length of material (contrasting or similar) to the ethnic material first so that you have either a waistband or a hem in a different fabric. I love love love what you have done with it! I too think it looks more South American hence I was really attracted to the colours and shapes. Nice work once again! 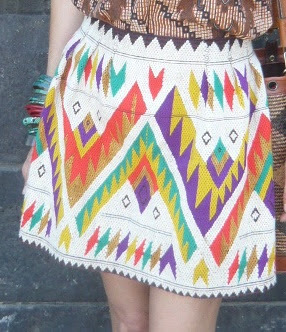 Agree, it does look more South American than South East Asian, great skirt!